Speakers at “Trump Proof the Bay Area” meeting. Kshama Sawant speaking. At far right is Gayle McLoughlin. Seated next to her is Jeremy Gong. The two women seated were the co-chairs – one from DSA and one from Socialist Alternative. On Sept. 16, socialist Seattle city council member Kshama Sawant, Richmond Progressive Alliance (RPA) member and candidate for California Lt. Governor Gayle McLaughlin, and East Bay DSA member Jeremy Gong spoke at a meeting in Oakland. The meeting, entitled “Trump Proof the Bay Area”, gave a glimpse into the state of affairs on the left. The question is who is setting the political agenda, though: Is it socialists or is it the Democrats? What has become clear over the last months is that it is the latter. The Democrats’ strategy is to ride the health care issue – and even the call for single payer – to a congressional majority in 2018 and into the White House in 2020, after which “single payer” will be left lying in the gutter like a drowned rat. 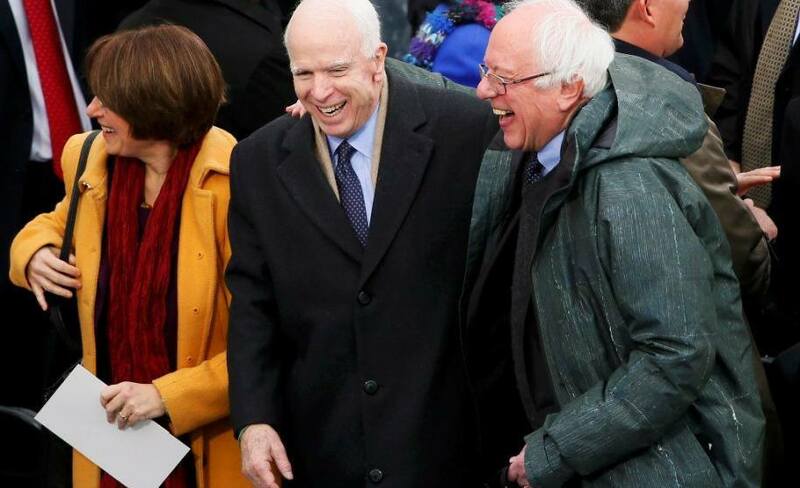 Bernie Sanders and Nancy Pelosi happily attending the convention with right wing Republican war hawk, US Senator John McCain. The liberal wing of the Democratic Party is the bait for the trap. Gong also implicitly recognized this. He said that the introduction of Sanders “health care for all” bill in DC “was a huge win for us because – we can’t trust the Democrats – but the Republicans will lose seats and the Democrats will win in 2018.” He then raised the perspective of the “Democrats riding Sanders coattails in 2020” into the White House. Then, if (really: when) they don’t pass single payer this will lead to a massive revolt in the Democratic Party. There are two questions the speakers should answer: First is why don’t we “take it seriously” when they didn’t deliver in 2008 or in Sacramento in 2017? How many times do we have to be fooled by the Democrats? And this leaves completely to the side the serious inadequacies of “single payer”, vs. socialized medicine. See this article for an explanation. The second question is what does “taking it seriously” mean? Sawant said that, in that case, we will have to “break with the Democrats and build a real, independent left force.” Gong raised the perspective of a wing of the Democrats splitting and building “an independent party”. What none of them recognize is that, if necessary, the “progressive” wing of the Democrats will be almost strong enough to push through single payer. Almost, but not quite enough. So, what is the “obvious” solution? Why, to strengthen that wing even further! And if you tie yourself to that wing now, you will be tied to that wing as it grows. Sawant commented on the thousands who support Sanders and are not ready to break from the Democrats at this point. But the conclusion she and others draw from this is that socialists should simply go along with them, that we should not explain the need for that break. Nobody is advocating ignoring these hundreds of thousands of Sanders supporters, but simply accepting their illusions in the Democratic Party is a violation of principles. It cannot work. Instead, we should sympathetically but clearly explain the history of this approach and what it means in practice. Those who are serious may not be willing to accept this right now, but they will remember it and evaluate it in light of their experience. Simply accepting their illusions leaves us unable to start to build working class independence now and unable to lead the creation of a mass working class party in the future. The speakers’ ties to the “progressive” wing of the Democratic Party, and through that wing to the party as a whole, is shown by their focus on the single issue campaign of “medicare for all”, which is the program and strategy of the Democratic Party. 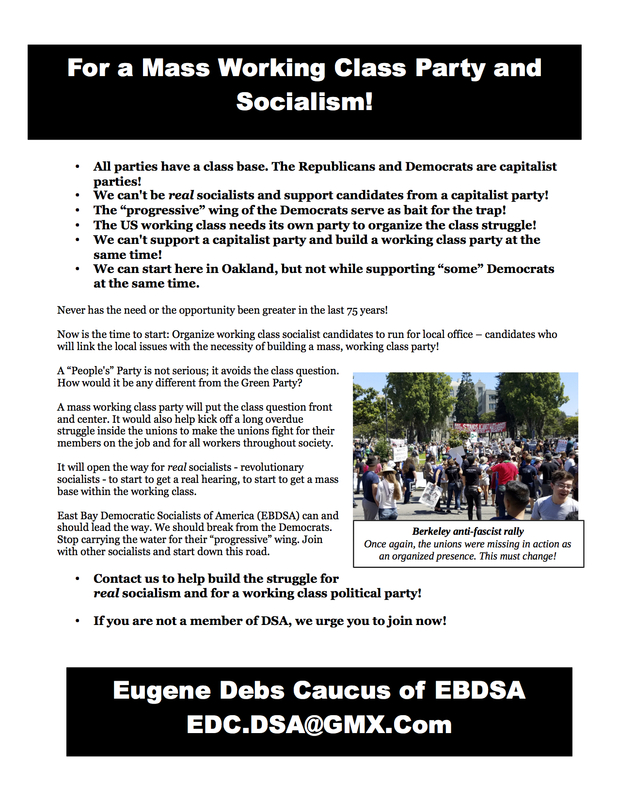 For example, during the discussion period a speaker from the Eugene Debs caucus of EBDSA raised the issue of gentrification in Oakland. This is an absolutely massive issue here, and is exemplified by the plan to build the Oakland A’s baseball stadium right across the street from Laney College, which is the only accessible community college in Oakland and is an absolute hub for working class youth, especially youth of color. This plan is central to the further gentrification of Oakland. As the speaker pointed out, yes socialists have their own views, but they must also listen to the working class; they cannot try to impose on workers what they – socialists – think are the important issues. That is especially important in an instance like this one, where the great majority of those in the socialist movement happen to be white and middle class. That is not meant as an attack on those individuals, but we have to recognize who we are and who we aren’t and go out of our way to listen to “others”. To emphasize: The issue of gentrification here in Oakland is partly an economic issue and partly one of simple racism, and it is absolutely huge in the minds of working class black people here. Yet neither Sawant nor Gong would touch the question. The only explanation for that is that they are allowing themselves to be drawn into following the strategy of the Democratic Party. This also includes liberal Oakland city council members like Abel Guillen, who are representatives of the real estate developers, pure and simple, but are on good terms with the union leadership. 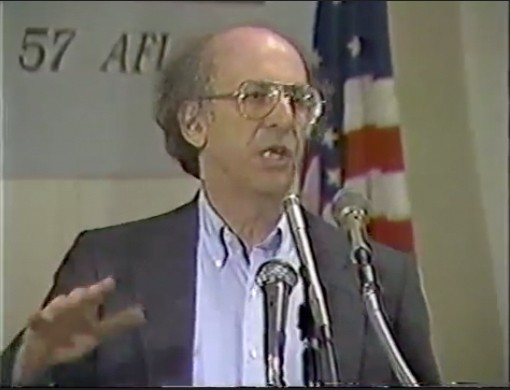 Tony Mazzocchi of the Oil, Chemical and Atomic Workers (OCAW) speaking at a meeting of AFSCME Local 444 in favor of a labor party (in 1989). If this reformist union leader could understand that it was a class question, why can’t socialists? “Big business has two parties; the working class needs one of its own.” This reformist former union leader went further than the socialists, neither of whom would touch this point. None of the speakers, in other words, would touch on the issue of the class basis for a new party, nor on the role of the working class itself in building such a party. For Gong it’s simply a matter of a split in the Democrats and for Sawant… Well, it’s impossible to know because she didn’t deal with the issue, other than to raise the perspective of an “independent left force”. The lack of focus on the working class itself was also betrayed in the complete lack of discussion of the state of confusion within the class as shown by the fact that an estimated 30% of union members who voted voted for Trump. This confusion is epitomized by the absence of even the beginnings of a mass working class party in the US. The fact that none of the speakers would touch this did not help. Related to this weakness is their singular focus on electoral politics. While it is a huge mistake to ignore or to dismiss that arena, it is an equal mistake to pretend that that is the only arena of struggle and that a working class political party’s only role would be to run candidates for public office. Such a party would be the organizing center for the struggle in the streets, work places and schools. Its development would also kick off a battle inside the unions, to make the unions do what they were built to do, which is to fight the employer. 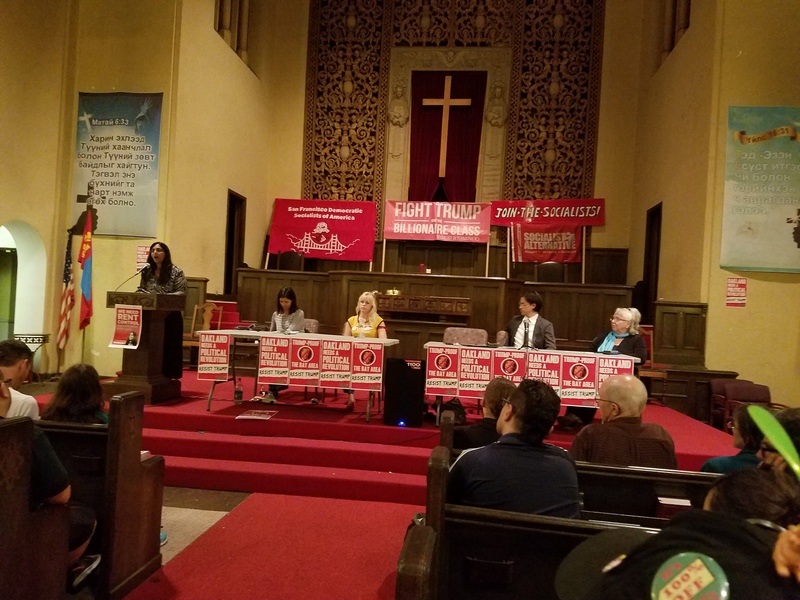 In apparently defending herself against left criticisms, Sawant defended having participated in the Seattle mayor’s minimum wage committee, which met behind closed doors to come up with a compromise proposal for a minimum wage. Sawant said she’d acted as “the shop steward for Seattle’s working class” on that committee. What she evidently didn’t consider is that it should be an iron law for socialists that they never hold behind-closed-door negotiations with the boss and don’t tell the members (the working class) what is being said behind those doors. Unfortunately, because Sawant participated in keeping those negotiations secret, the movement in Seattle was caught unprepared for the unsatisfactory compromise that was worked out and as a result was unable to put up a ballot ordinance for a real 15 Now – as in “now”, not seven years from then. In light of her experience as mayor of Richmond, McLaughlin was asked about budget shortfalls. “If the money isn’t there,” she said, “you have to make these decisions.” The only way to interpret this is that in that case you have to make the “hard” choices over where to cut. Socialists should draw instead on the example of the Liverpool, England, left Labour city council of the late 1980s. There, they made an “illegal” budget, made contingency plans to organize to shut the city down, and forced the Thatcher national government to grant them thousands of pounds extra. The position of the socialist “Militant” wing of the Labour Party there was “it’s better to break the law than to break the poor.” But if you don’t rely on the working class, if you don’t base yourself on the working class, then how can you take that approach? Instead, you have to take the approach of managing capitalism in its era of crisis on behalf of the capitalists. Meanwhile, we should keep in mind that capitalism is a system of turmoil and crises, never more than today. All these plans for a smooth transition to a Democratic majority through focusing on the health care issue can be overturned in a flash. Did you see that there was an article in the most recent print edition of Jacobin about Anthony Mazzocchi? I was curious if that was what brought him to mind or if it was a coincidence that “The speaker from the Debs caucus” cited him. If people recognized him it might make the point more powerfully. No, I didn’t see the article. I was at that meeting where he spoke, from which this picture is taken. And I was very involved in his “Labor Party” and used to hear him say that many times. It might be good to write something about him that relates to the popularity of Jacobin and their publishing of an article on him but also talks about his efforts on the Labor Party.